Some of the $1,000 will be used to fund these elite runners' travel to Grandma's Half Marathon in Duluth, MN this summer for their attempt to secure Olympic Trials qualifiers. Great races guys! Crazy inflatable waving arm men for everyone! Billy was a Pacer????? April 3rd Fools? Yes, I was wondering about this too. And Wardian. Although the latter has previous ties to the Store, Billy must have been brainwashed. Billy had to join their team as a condition for staying at Bert's this past weekend. how come we didn't have an elite team for our ladies? Jake, I saw Bert take out a deck of cards and show Billy a Queen of Diamonds prior to the race. Yes. It's true indeed. I asked Billy if he would run for Pacers as a condition of staying with Susan and I for two nights. After first disagreeing and finding our front door slammed in his face, I believe Sarah talked some sense into his normally thick cranium and he ended up taking me up on the reasonable offer. So there it is, a few nights of shelter traded for a lifetime of loyalty to the Pacers Racing Team!! At least I think that's the way it all unfolded. By the way I'm going to destroy Karl in Big Buck Hunter. Nice try Bert. You couldn't take us down even with your ringers. 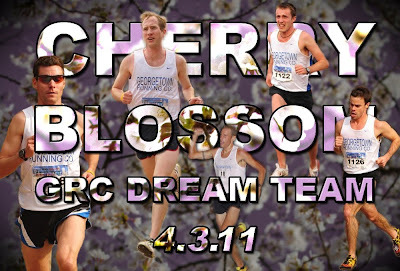 We raced with guys who all run together multiple days a week. The GRC victory over Pacers will be happen again when we compete at Big Buck Hunter. Your ringers can't help you there either. Congrats GRC - that was an impressive performance! Bert's cranium is clearly thicker - who else would go to the Navy when he wanted to fly? Anyway, I ran for them because he agreed to come to the good side in the near future. Yeah...you guys ran a lights out race. But don't even get me started on ringers I heard all the talk of trying to put Nightingale on the team 10 days out from competition. I think any talk of ringers has to touch on PR using Tim Young last year while he was working at VA Runner. No need to argue about this because he didn't run for us, but Dave trains with us, and is more of a GRC member than the guys you used. I am just kidding around though, I don't hold it against you guys. As far as you're concerned though Bert, I think the old saying holds true regarding this outcome: if you can't beat 'em, join 'em. I hope to run with you a lot more! The 2007 Pacers team was legit - 3 x 50:00.